One of the common themes that surfaces in eugenic writings is their annoyance that others do not act on the logical implications of Science. Note that, in the main, they are not taking issue with people who do not agree with their conclusions, but rather those who do agree–but will not act on them. This post will contain a running list of quotes expressing this complaint. But should our legislators see practical difficulties in the way of a system of legislation so radical and revolutionary in the social life and economy of the people as the above programme [of forbidding defectives to reproduce] would indicate, still the least it can do is introduce these biological remedies to the attention of the public, in the education of the young. It is ignorance that has destroyed us in generations past. It is ignorance of the functions of life and of the laws of reproduction that destroys us to-day. We cultivate with more skill even the grapes and grains than we do the propagation and reproduction of our own species. Marriage is a hap-hazard affair, the result of caprice or fancy, instead of being the result of judgement and knowledge of the fundamental laws of being. Science and the public law, are alone, perhaps insufficient to do justice to this noble cause. They invoke the aid and cooperation of the pulpit and of the public teacher. A wise supervision of this subject is indispensable to the future wellbeing of the race. False standards of delicacy must be set aside. Morbid sentimentalism must give way to the suggestions of common sense and a rational philosophy. G. P. Mudge, “Biology, Theology and Medicine in Relation to the State.” London Hospital Gazette, 1911. As quoted by Leonard Cole at the First Conference for Race Betterment in 1914. No doubt it seemeth right to alleviate misery, to feed the hungry, to clothe the naked, to pamper the useless, to preserve the criminal, to propagate the congenitally tuberculous and imbecile. But is it? When we have cast aside the garment of make-believe, by which the well-intentioned, the sentimental, the languidly pathetic, the short-sighted man of medicine, the socialistic place-seeker and others have woven around the stern facts of life, thereby masking the implacable laws of Nature, and when we honestly ask ourselves whether this road, which seems right to us, is in reality a path that leads to national destruction, then I do not think we shall proceed at the reckless pace which marks the present. For so long as we do not hold fast to that immutable truth [of heredity], we shall recognize that from the race of civic cripples there is begotten a race likened unto them. Helpless, useless, dangerous, burdensome, and loathsome that they are, I say advisedly, carefully weighing my responsibility, that it is a social crime to do anything which shall encourage and facilitate their propagation. Every day that by the aid of medical science the lives of such are lengthened, and the procreation of their race thus far favored and increased, there is added a burden to the present and a curse to the future. It is facinorous to an extreme degree. It is sapping at the vigor, the health, the happiness, the social morality, and the civic cleanliness of the nation. A nation of cripples cannot endure. If it sinks not beneath the weight of its own helplessness and misery, it cannot escape destruction at the hands of a more virile people. Every medical enactment or sentiment which tends to the preservation of such people, also contributes to the undoing of the nation. Much of the discussion aroused by Dr. Haiselden when he permitted the Bollinger baby to die centers around a belief in the sacredness of life. If many of those that object to the physicians course would take the trouble to analyze their idea of “life,” I think they would find that it means just to breathe. Surely they must admit that such an existence is not worth while. It is the possibilities of happiness, intelligence and power that give life its sanctity, and they are absent in the case of a poor, misshapen, paralyzed, unthinking creature. … The toleration of such anomalies tends to lessen the sacredness in which normal life is held. It seems to me that the simplest, wisest thing to do would be to submit cases like that of the malformed idiot baby to a jury of expert physicians. An ordinary jury decides matters of life and death on the evidence of untrained and often prejudiced observers. Their own verdict is not based on a knowledge of criminology, and they are often swayed by obscure prejudices or the eloquence of a prosecutor. Even if the accused before them is guilty, there is often no way of knowing that he would commit new crimes, that he would not become a useful and productive member of society. A mental defective, on the other hand, is almost sure to be a potential criminal. The evidence before a jury of physicians considering the case of an idiot would be exact and scientific. Their findings would be free from the prejudice and inaccuracy of untrained observation. The would act only in cases of true idiocy, where there could be no hope of mental development. … Conservatives ask too much perfection of these new methods and institutions, although they know how far the old ones have fallen short of what they were expected to accomplish. We can only wait and hope for better results as the average of human intelligence, trustworthiness and justice arises. Meanwhile we must decide between a fine humanity like Dr. Haiselden’s and a cowardly sentimentalism. In concluding this revision of the racial foundations upon which the history of Europe has been based, it is scarcely necessary to point out that the actual results of the spectacular conquests and invasions of history have been far less permanent than those of the more insidious victories arising from the crossing of two diverse races, and that in such mixtures the relative prepotency of the various human subspecies in Europe appears to be in inverse ratio to their social value. Bearing in mind the extreme antiquity of physical and spiritual characters and the persistency with which they outlive those elements of environment termed language, nationality, and forms of government, we must consider the relation of these facts to the development of the race in America. We may be certain that the progress of evolution is in full operation to­day under those laws of nature which control it, and that the only sure guide to the future lies in the study of the operation of these laws in the past. We Americans must realize that the altruistic ideals which have controlled our social development during the past century, and the maudlin sentimentalism that has made America “an asylum for the oppressed,” are sweeping the nation toward a racial abyss. If the Melting Pot is allowed to boil without control, and we continue to follow our national motto and deliberately blind ourselves to all “distinctions of race, creed, or color,” the type of native American of Colonial descent will become as extinct as the Athenian of the age of Pericles, and the Viking of the days of Rollo. Margaret Sanger, 1922. 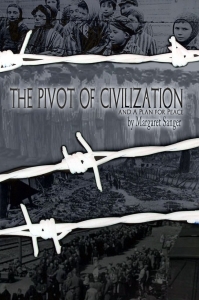 The Pivot of Civilization pages 38-39. (3) Eugenics: Eugenics seems to me to be valuable in its critical and diagnostic aspects, in emphasizing the danger of irresponsible and uncontrolled fertility of the “unfit” and the feeble-minded establishing a progressive unbalance in human society and lowering the birth-rate among the “fit.” But in its so-called “constructive” aspect, in seeking to reestablish the dominance of healthy strain over the unhealthy, by urging an increased birth-rate among the fit, the Eugenists really offer nothing more farsighted than a “cradle competition” between the fit and the unfit. They suggest in very truth, that all intelligent and respectable parents should take as their example in this grave matter of child-bearing the most irresponsible elements in the community. “The Eugenic Value of Birth Control Propaganda,” Oct 1921. Dr. Richard J.A. Berry, Letter to the Editor of The Eugenics Review, The Lethal Chamber Proposal c. 1930. SIR,-I observe in your issue of April 1930, page 6, that you attribute to me, probably through some misunderstanding, not my own view and words, but those of a newspaper reporter, on the question of a National Lethal Chamber for the grosser types of our mental defectives. I have never, at any time or anywhere, “seriously suggested” such a procedure, though I did say in The Times that I thought, when all had seen what I have, that there would be many who would agree with me that such an act of extinction would be the kindest, wisest, and best thing we could do for all concerned. Until I read your April number I was unaware that even this mild opinion had aroused either support or a ” storm of protest.” Certainly none such appeared in The Times, but in any case I do not share your views as to the ” sanctity of human life ” or ” the almost insuperable legal and practical difficulties ” which a lethal chamber would involve. There was surely little or no sanctity of human life in the War, and there do not seem to be any legal difficulties involved in judicial murder by hanging. By a stroke of the pen the politician condemns hundreds of thousands of his fellow-men to death as fodder for cannon, and the law can always take away the “sanctified” life of the murderer. Why, then, should we be so anxious to preserve the life of the almost brainless, senseless, speechless idiots and imbeciles when it seems almost pathetic to condemn them to live their lives as helpless automata? Why spend, as I am informed England actually does, £93 per annum per head on such human refuse, and only £12 per annum per head on the normal, healthy child? And we seek the reply in the “sanctity of human life'” and the sentimentality of a national ignorance which seems to believe that a human mind can exist without a human brain. Every living animal, man included, conforms and must conform, whether he wills it or not, to the two great Laws of Nature-the Law of Self-preservation and the Law of the Reproduction of the Species and Nature takes no risk in her ample provision for both. Sterilization cuts across-in more senses of the word than one-the second of these laws. Segregation appears to interfere with both; whilst a lethal chamber attacks the first of these laws, and incidentally the second as well. If Professor E. W. MacBride be correct-and there can be none familiar with the facts who would differ from him-that unless the birth rate of the mentally defective be restricted, “the British Nation as a virile people, is doomed,” it appears probable that politicians and people will both have to face all three-Sterilization, Segregation, and the Lethal Chamber. I have frequently been asked, especially since my return to this country: Is mental deficiency appreciably worse to-day than it was fifty or a hundred years ago? Has there not always been mental deficiency amongst us? And the answer to both questions is unhesitatingly: Yes. But fifty or a hundred years ago, as indeed through all the long ages of the past, we did not pamper, clothe, and care for the mentally deficient, but allowed Nature to take her own proper course, and the weakest went to the wall, and thus a decent natural balance between the fit and the unfit was maintained. But that is not the case to-day. To-day, under the urge of a mawkish sentimentality, we house our mental deficients in ducal palaces, do our utmost to prolong their lives, employ able-bodied women to attend to those physical wants they are themselves incapable of performing, and seek by every means, both in and beyond our financial power, to prolong lives which, on account of the lack of brain, are neither useful nor human. Civilized society, in its reaction from old-time severity, is now swinging far beyond the middle point of safety toward the extreme limit of indulgence, and this alarming indication is especially noticeable in the United States. The sentiment of altruism is becoming a great factor in the shaping of human destiny, and this is well; but if it be not controlled by reason it will work even worse disaster for the race than has ever been wrought by selfishness. There is no surer means of spoiling a child than the influence of weakly indulgent parents, and in society at large the influence which we have most to fear is a spreading phase of sentimentalism, miscalled philanthropy. This is a great post! I completely sruoppt birth control measures. Instead of stamping out abortion, why not focus on preventing unwanted pregnancies? People should still use condoms to prevent STDs, but birth control has many advantages that are not widely known. For instance, the pill actually helps preserve a woman’s eggs and prolongs fertility. I wish I would have known that in my 20s. It also minimizes the monthly issues and some can improve complexion. Obviously, I got off on a tangent. I have been talking to my little sister (19 years old) & my mom about reasons she should be on birth control despite being a virgin. My sister actually thought that Planned Parenthood was the only place to get birth control. Sometimes naefve Mormons make me roll my eyes. I told her to go to her doctor.